Acadian Genealogy Homepage; New England! It is mid-June (1996) and the heat has finally come to Maine's St. John Valley, the northernmost stretch of America's lower 48 states. In the tiny country store on the outskirts of Madawaska, the valley's largest town, a graying woman chats affably with two young girls and a boy. "Your parents, they are well?" she asks. The girls nod and giggle. The boy, emboldened, asks, "It's hot. Will you buy us an ice cream?" She smiles. Oui, si vous me demandez encore en Français" (Yes, if you ask me again in French). The boy, who sports a Boston Red Sox cap, looks unsure of himself. "Go ahead," one of his sisters says.."Ice cream." He hesitates, then says haltingly, "Je voudrais...ice cream...s'il vous plait." The woman waits to see if he might add something more. He doesn't. "Close enough, I suppose," she says, pulling out her purse. "But the word for ice cream is la glace." A canoe ride from New Brunswick, closer to Quebec City than Bangor Maine, the valley the locals call "Chez Nous" (our home) is a beautiful region, marked by the river, rolling farmland, white-steepled churches and remarkably friendly people. It is a place, its boosters like to say, where parents still parent, teachers still teach and preachers still preach. But, as the overheard conversation suggests, it is also a gently schizophrenic place where the velvet clash of cultures, generations and languages has taken center stage in recent years. At the heart of these countless social tussles, is a question: How can the proud citizens of the St. John Valley,which stretches from Hamlin, west to the village of Allagash, preserve the Acadian culture that has helped define the region since the late 1700's? Language, family, Catholicism and custom, grounded life north of the Maine woods for centuries. But in the last 50 years, that ground has eroded. Misguided efforts to eradicate the valley's colloquial French dialect, have been too successful. Families are smaller; children move away for better jobs. Churches have closed; fewer families farm for a living. "It's all in danger of fading" says my good friend Geraldine Chassé. "Most of my children have moved away, three of them to Arizona. They speak French when they visit, but they aren't passing it on to their kids. My five boys were altar boys, but none of them goes to church now." Chassé is silver-haired, nimble-minded and gregarious. She lives in the village of St. David, east of Madawaska, in a farmhouse just above rich bottomland near the St. John River. The shelves in her living room, are packed with books of genealogical research about the valley's families. 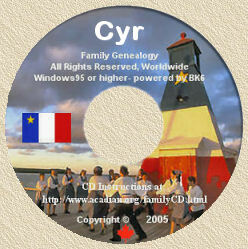 Chassé has been instrumental in organizing and running the annual family reunions that bring back thousand of Acadian descendants to the valley, each year. Chassé is rushed today, because the (1995) Chassé family reunion is only two weeks away . "Oh, they're very emotional," she bubbles. "People arrive and break down crying and kiss the ground and hug long-lost relatives. For people from the valley, how you're connected, what family you are from, is incredibly important." That's an understatement. Chats among strangers here, often begin with detailed questions about mothers, fathers and grandparents. Each summer, a popular magazine called Paper Talks is published, filled with nothing but photographs of various extended valley families. Almost every storefront business from Van Buren to Fort Kent (Maine) carries a name, a way of making that business personal. But to understand the depth of meaning "family" carries in Chez Nous, you must go with Chassé down to the banks of the (St. John) river behind her house where a large marble (Acadian) cross rises. It stands as a monument to the 16 Acadian families that first settled near Madawaska in the mid 1780's which Chassé and others on the valley talk about, as if it were last week. Behind the monument are trees planted by the descendants of those pioneers at the annual reunions. Chassé points down at the St. John. "They came upriver by canoe. They were the progenitors that many people up here can trace their families to." The ancestors of the St. John Valley settlers migrated from south-eastern France in the early 1600's. They established a settlement near the mouth of Maine's St. Croix River and then moved farther north to Nova Scotia. For the next 150 years the French and English vied for the lands of Acadia, culminating in a tragic British deportation of the French colonists in 1755 when most of them refused to sign oaths of loyalty to England. The Acadians ended up dispersed throughout North America, many of them to Louisiana, where they came to be known as Cajuns. Others resettled in New Brunswick, only to be forced off their land again. Members of this band eventually came upriver to the valley. Here they and their descendants lived and intermarried with French Canadians in relative seclusion for nearly 150 years. "Before World War 1 there was a certain degree of isolation here, and it was no problem to preserve the culture," says Guy Dubay, Chassé's friend and a local historian. It was a farming culture, a culture that placed a premium on family. Large households were an asset; they meant more hands to pick potatoes and cut firewood and draw water. Men farmed in the summer, hunted in the fall, and left for work in logging camps southwest of the valley during the long winters. Women ruled in their absence, passing on the language and the Acadian work ethic to their children. While there had been out-migration from the valley after the Civil War as families followed logging camps west to Montana and Oregon, the truly radical changes began during the World Wars, as large numbers of men left for the service and returned influenced by the greater American culture. That influence was magnified during the 1950's and 60's as farmers got jobs at Loring Air Force Base or at the Fraser paper mill in Madawaska. They bought televisions, refrigerators and cars. The population, which had peaked during the 1930's and 40's, started to decline as many young people left, looking for work. At the same time, the church's influence waned. The average number of children per family dropped from between 7 and 9 two generations ago, to 1 or 2 in the current generation. In 1962 half the people in Madawaska were under age 19. Today there are three adults for every child in town. "The family is still powerful, but it's graying," says Dubay. "To many kids here, Acadian means Grandma." Compared to the rest of the country, St. John Valley families still seem right out of Ozzie and Harriet. In the early evenings, neighbours chat over the back fence. Groups of women take long walks for exercise while their husbands take children fishing. Baptisms, weddings, anniversaries, graduations and funerals are big, well-attended family events. But Dubay and others believe that the current generation probably doesn't look at family the way their parents and grandparents did. Divorce, single-family households, absentee fathers are now showing up in the valley. Still, that Acadian yearning for connection remains strong, even among those who left the St. John Valley long ago. Consider the tremendous response the valley gets for its family reunions, timed to coincide with the five-day Acadian Festival held in the last week of June. Reunion committees send out 5,000 to 35,000 invitations, depending on the family that's been chosen for the yearly event. During the CYR family reunion in 1981, more than 4,000 descendants showed up to party. "They can leave Chez Nous , but they can't let it go," Chassé says. During the reunion, family members go on a historical tour of the valley. There is a procession that includes the planting of a family tree at the Acadian Monument. French masses are held. There are barbecues and talent shows, dances and banquets featuring Acadian foods such as fougère boiled fiddleheads), pot-en-pot (a meat stew) and ployes, the traditional buckwheat pancake. Genealogical research about each family is published and sold. "It's the old roots thing," Dubay says. "They come to link up with their heritage." Dubay thinks that is important, but not as important as the effect the reunions and festivals have on the shrinking pool of children growing up in the St. John Valley. "None of what it means to be Acadian will be passed on until kids who still live here, develop their own sense of what it means to be Acadian. It has to go beyond Grandma and become personal." If you get the sense that the crisis in the Acadian culture is generational, you're right. And nowhere is that more apparent than in the use of the French language, Go to any public place in the valley...say the Tang Palace in Madawaska...and listen. At the booth in the far corner, three women in their late fifties eat and joke among themselves in the distinctive French dialect of the valley. Two booths away, conversation between a husband and wife in their late thirties, mutates from French to English and back again. Behind them a group of teenagers speak strictly English. "What you're witnessing is the result of linguistic and cultural genocide," says Judy Paradis, a Maine state senator who, together with her husband, Ross, is an outspoken advocate of keeping the valley bilingual. "If you lose the language, you lose the culture. It's as simple as that." Historically English has been making inroads in the valley since the mid-19th century. Men who left each winter for the lumber camps had to learn to speak English. Their wives passed on the valley language, particularly by virtue of a lexicon that's tied to the original Acadians' nautical backgrounds. You don't "go to the fields" in valley French...you go au large, which is what French fishermen say when taking to the sea. The river is referred to as le bord, the edge, closer to the idea of a beach than a river. Homes don't have les escaliers (staircases), they have les échelles...ladders. "It's closer to the 17th-century French than anything," says Paradis. But because it was different, almost a language in a time capsule, for years many from the valley thought it was inferior. This inferiority complex was made worse by the fact that, even though they lived closer to the hub of French-speaking Canadian culture than that of the United States, they felt pressure to "act American". As a result, many people became embarrassed to be Acadian, discouraged their children from learning French and even Anglicized their last names. Françoise Chassé became Francine Hunter! At the heart of the official effort to "Americanize" the Acadians, was the eradication of the French oral tradition. That effort reached its peak between 1940 and the early 1960's with a formal policy in valley school systems that banned French on school grounds. Madawaska even had an administrator whose sole job was to see that French was not spoken in school! People in the valley clearly remember having to write "I will not speak French at School" 150 times for breaking the English-only rule. Don Levesque, now managing editor of the St. John Valley Times, went to school in Grand Isle and recalls a more Orwellian brainwashing scheme. "The nuns had a point system based on movie tickets they got from somewhere," Levesque says. "The idea was that everyone started the day with a ticket. If you heard someone speaking French, you'd shout out, 'Be wise, speak English' and they'd have to give you their stub. The kid with the most stubs at the end of the week, got no homework! It was a secret-police mentality and led to all sorts of fights. That sort of thing had a rippling effect on my generation." There was a slight easing of the policy in the late 1960's, when school officials noticed that as result of the "Be Wise" policies, test scores among French-speaking children had plummeted. Valley schools applied for federal funds for bilingual language training. But the funds were earmarked to help the children to learn to speak and write better in English, not to teach them to speak both languages effectively. It was a more subtle way of wiping out valley French, than the punitive system Levesque remembered. And perhaps more effective; a 1992 study by a New Brunswick professor determined that after nearly 25 years of transitional bilingual education and bombardment by U.S. television, it is rare to hear French spoken by young people in the St. John Valley. "It's almost too late to keep our culture alive," Dr. Rodrigue Landry told valley parents in a speech in early 1995. Landry advocates total-immersion French programs in the schools, to keep the language and culture breathing. Several valley school systems have applied for and received federal funds, to support such a system. There are also active grassroots campaigns. The road signs in Grand Isle and Lille are all in French. Paradis and others, including Dr. Marc Chassé, a chiropractor in Fort Kent, have organized Le Club Français, a committee that does everything from putting signs in local stores that say the proprietor speaks French, to sponsoring public-speaking contests in the language. But perhaps the most powerful effort has come from the most unlikely sources...the local newspaper. Until 1988, the St. John Valley Times rarely used French in their stories. Enter Levesque, a funny, feisty guy who grew up in Grand Isle and now lives across the river in Edmundston, New Brunswick. "I have always believed a newspaper should reflect the community it serves," says Levesque, who became editor shortly after the paper changed hands. "We are French here, we speak French here." Levesque decided to write a column about Acadian colloquialisms. The piece was laced with local French dialect and its publication provoked an uproar. "Nothing I've written before or since, has had the effect that piece did," Levesque says. "People came up to me on the street, shook my hand, saying they couldn't believe it. It was as if putting it in the paper, we'd legitimized it. We'd said it was OK to do that, to speak French and be Acadian. And they wanted more." Levesque has continued to publish his column about the language and Acadian customs. He has also pushed his reporters to keep the issue alive, covering debates and lectures about efforts to preserve the vanishing culture. Even so, the effects of those years of punishment are hard to erase. Levesque says that during job interviews, he'll ask prospective employees if they speak French and, as a rule, they'll say "no". But within a few weeks of their being hired, he'll walk by their desks and hear them speaking French on the phone. "People still have this perception that outside the home, speaking French is a bad thing," Levesque says, "probably because the English-language culture is everywhere...on the radio, on television. They can't help being bombarded with it." Levesque and Paradis believe that if the language is to be saved, it will be for economic reasons. Parents and children are beginning to understand that fluently speaking two languages, leads to college scholarships and better jobs. The issue now is getting the government to support true bilingual education in the valley. "French is all but dead in Louisiana," says Paradis. "The last hope for the United States to have native French speakers, is right here. We are an economic asset and we're doing our best to keep it alive. But we need help." While the French language is on its last legs, the Acadian culture's Catholic underpinning remains strong. And like everything else in the Acadian culture, its importance goes back hundreds of years. Consider the story that for three decades after the first Acadian families arrived, they had no priests for the small chapels they built in their settlements, except for the Jesuit missionary who came every Easter season to say Mass. When he didn't appear one year, almost 100 Acadians paddled 75 miles upriver to attend Mass in Quebec! That devotion was passed down from generation to generation. Doris Paradis, 58, remembers that every Sunday and every holy day of obligation they went to church, no matter what the weather. "There were 18 children in my family, and I remember my dad piling us all into this caboose kind of wagon, pulled by a horse, heated with a woodstove, and that was the way we went the three miles down to church in the dead of winter," Paradis says. "It was strict. There was no thinking that we weren't attending Mass." But Paradis admits she is not as fanatical in her devotion to the church, as her parents were. Like many Catholics, she questions the institution and says her children are even more skeptical. Indeed, though stronger in the St. John Valley than perhaps anywhere else in the United States, the Catholic church's power has ebbed. Population loss and inroads from fundamentalist Christians, have resulted in the closing of churches in several villages and towns. Attendance at other churches is down. Priests no longer teach in the schools. Nuns no longer run the hospitals. Still, on a drive up Route 1 from Van Buren to Fort Kent, you can't help but notice home after home with a shrine to the Virgin Mary out front, or the white crosses by the side of the road, or the church buildings that dominate every small village. Here people still talk about getting used to the effect of Vatican II, a shift in Roman Catholic doctrine that occurred more than 30 years ago. Here the ordination of a priest is front-page news. "Despite what's happening to the church elsewhere, it's still very much alive in the valley," says Don CYR, whose life's obsession is restoring a magnificent Catholic church in the village of Lille. "Each generation drags the next to the church. It may not be as strong as it was in the 1950's, but it is surviving. CYR, a burly, bearded descendant of the valley's original settlers who teaches Acadian history, humanities, and art at the University of Maine's Presque Isle campus, has spent nearly ten years trying to turn the Church of Notre Dame du Mont-Carmel, into a museum and cultural center. It is a fitting role for the massive structure, he says, because of the importance Acadians put in their faith. "Look at the towns here," says CYR. "The town halls aren't beautiful, imposing buildings. The churches are. They were the real civic centers. They were the only public building most towns needed because the churches, not local government, were the only way to organize people. In the late 19th and early 20th centuries, the church was so powerful that when a priest passed you by, you'd go down on your knees," CYR says. "That's not true now. The priests are still powerful in the sense that they are respected. But they don't tell you how to vote like they used to." Nor do they have as much to say in the personal conduct of parishioners; the decrease in the birth rate in the valley, is almost universally attributed to the use of birth control, in defiance of Catholic doctrine. And while some parishes, such as St. Luce's in Frenchville, remain strong, the last service in Lille was held in 1978. Since then CYR has waged a campaign to preserve the grand edifice with the twin spires. "There's not another one like it anywhere in North America," says CYR, who lives next door in the old rectory. The church was designed by a French architect names Theophile Daoust. Carpenters were brought in from Montreal to build the domed towers and the people of Lille commissioned Louis Jobin, a Quebecois sculptor, to carve life-size wooden angels to sit atop the towers. In 1909 the parishioners paid $14,000. to build Notre Dame du Mont Carmel. To date, CYR has spent $400,000. and thinks it will require an additional $200,000. to finish the project. Inside the cathedral-like structure is awe-inspiring. The barrel-vaulted ceiling combined with the two-story clear glass windows create the sense of lofty, immense space. Marbleized columns rise to cornice below the vault, upon which stand painted life-size statues of the apostles. Here and there are strewn the efforts of CYR's restoration effort: wooden planks, plaster dust, and the repaired wooden angels. They will be displayed inside the church, replaced on the towers by sturdier reproductions. In the basement, CYR has almost completed work on a small performance space for Acadian singers, instrumentalists, dancers and actors. He sees the church as a way of rescuing part of the culture before it vanishes. "Lille used to be a thriving place where farmers lived and went out to their fields. There are still some farmers and it's the last real agrarian village in the valley. But it's also a village in decline, no store, no post office." It's the same story throughout the St. John Valley. Farming dominated the Acadian culture well into the 20th century. But in the last 40 years, scores of farms have gone under or been left idle while the owners have gone in search of more stable employment. "It's sad," says Romeo Chassé, an 80 year old from St. Agathe, who farmed potatoes, oats and buckwheat his whole life. "When I was growing up. there were 100 farms from here to Frenchville. Now there are probably five." Chassé's father was a farmer, as was his grandfather and great-grandfather. None of his six children was interested in taking over the farm. His son, Clifford, a school principal in Madawaska, leases his father's hundred acres to another farmer. Still, there are some hopeful signs: dozens of men and women who work at Fraser Paper Incorporated, the valley's largest employer, plan their vacations to coincide with the annual potato harvest in September. For a\Acadians like Don Levesque, the newspaper editor, it's just one more instance of a way of life struggling to be passed down to the next generation. "They don't go to the fields in September because they need the money, but because they love the land," says Levesque. "Most of our families go back as many as nine generations here. The valley is in our genes by now. They go because they remember what it was like to be young and to get up at 5:00 A.M. to ride in the back of a pickup and work all day in the fields beside your friend and family and talk to each other in a language that ties you together. But there are a lot of kids growing up these days here, who will never experience that, and that, I fear, is the greatest challenge facing us...how to impart to our children, who are the endangered generation in all this, that sense of being on earth, here, part of a thread that goes very far back in time." I am very grateful to my good friend, Geraldine Chassé, for having provided me a copy of this most interesting article which was written by Mark Sullivan and published in the June 1996 issue of the Yankee Magazine. It is reproduced here with thanks and Geraldine's permission.